Tobias S. Buckell is well known as the New York Times bestselling author of Halo: The Cole Protocol. Tor is now proud to reintroduce Buckell’s first science fiction novels to his many fans in handsome trade paperback editions featuring stunning new cover art. In a universe run by alien tyrants, humanity faces its greatest threat―systematic extermination. The Benevolent Satrapy, the universe’s overlords, has placed a stranglehold on all technology, sending its stormtroopers to destroy any civilization foolish enough to defy them. The Ragamuffins are pirates and smugglers plying the lonely spaceways around a dead wormhole. For years the Satrapy has tolerated them, but no longer. 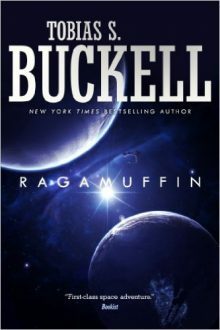 The aliens are determined to wipe out the unruly humans once and for all, and the Ragamuffins now face a campaign of extermination. But one runaway woman may complicate the aliens’ plans. Surgically altered, Nashara is more machine than flesh, and she carries inside her a doomsday weapon that could reduce the entire galaxy to chaos. But, all she wants to do is make it home before she’s forced to destroy civilization―and herself….